You can’t get too far in the fight to keep Jumbo Wild before you cross paths with KL Kivi. A fiery, passionate advocate with a heart of gold, KL has a gift with words and a knack for cutting through to the heart of any matter. 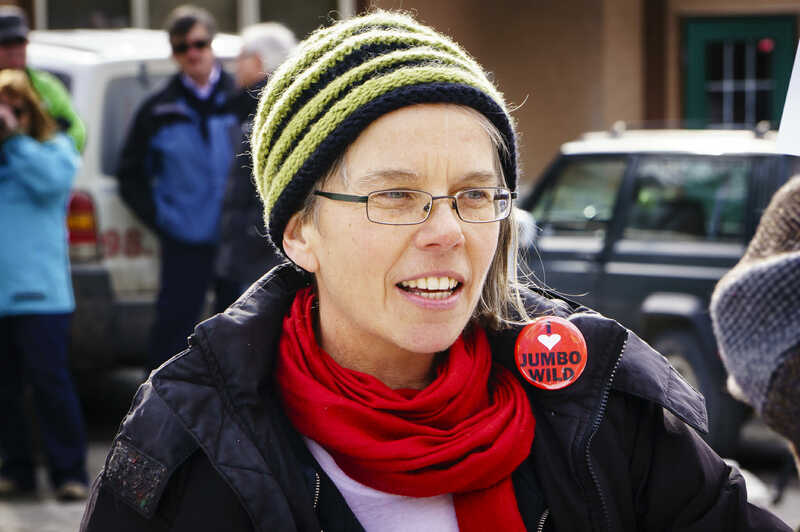 Based in Nelson and a long-time member of the West Kootenay Coalition for Jumbo Wild, KL’s contribution to Jumbo Wild over the decades has been immense. 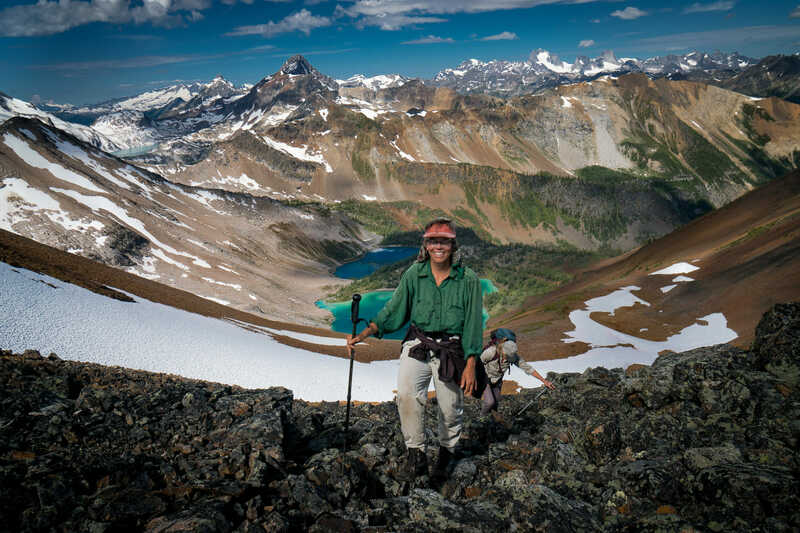 She was one of the pillars of the Farnham and Jumbo Monitoring Camps—when her shift was done, she packed up her bag and hiked back home over Jumbo Pass, dropping into Glacier Creek and Argenta. She was the force behind the “Purcell Suite: Upholding the Wild,” a beautiful compilation of essays, narratives and poetry on the magical Purcell Mountains. While proceeds from the book went to support the Jumbo Wild campaign, the book shone a light on the need to protect the wildlife, intact ecosystems and glaciers of the Purcells as whole. I recently sat down with KL to ask her a few questions. Robyn Duncan: When did you first hear about the Jumbo Glacier Resort? 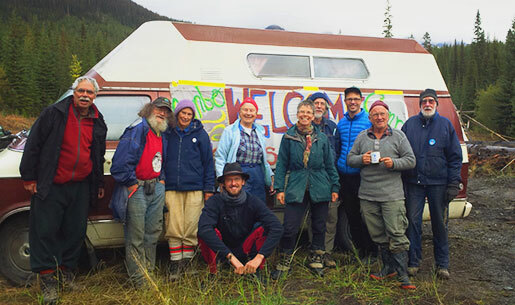 KL Kivi: Some time in the mid-1990s my friend Matt Lowe introduced me to the issue and I joined what might have been the first east-west hike up to Jumbo Pass that year. K. Linda Kivi at the Jumbo Rally for Democracy in front of the Radium, B.C. Village council chambers where the Jumbo Resort’s first meeting as an appointed town council was held. RD: There are so many reasons to oppose the Jumbo Glacier Resort. What for you is at the heart of your opposition? KL: The heart of my opposition has a few significant threads. One thread is my need for there to be intact, substantial wilderness in the world where all of creation is free to live in some kind of ecological integrity. That integrous system can include people, but not corporate megalomania of the Jumbo Glacier Resort variety. A second thread is that the capitalist system has undermined democracy to the extent that, in spite of massive opposition to this development in the region, our provincial governments have continued to support Glacier Resorts in this massively destructive venture. That the rights and responsibilities of the First Nations with deep stakes in this region – the Ktunaxa and the Sinixt – have been completely overridden, speaks to the same phenomena of valuing extractive economies over ecological and democratic values. RD: You’ve been deeply involved in the fight to keep Jumbo Wild since the beginning, from rallies to hikes, books to monitoring camps. Is there one moment that has stood out for you in the last 27 years? KL: One! I will give two. The 2004 rally in Nelson when I turned around from my place near the front of the march down to the Prestige Inn and witnessed over a thousand people flowing down Hall Street, their voices like a a huge flock of gulls filling the air. The full September moon rising golden over Commander Glacier while all of us in the Jumbo protest camp (Farnham Creek 2013) stood in silent awe and solidarity with that wild place. RD: The campaign to keep Jumbo Wild has been going on for 27 years. It’s arguably one of BC’s most successful environmental campaigns, because Jumbo is still wild. What, in your opinion, is the biggest strength of the Jumbo Wild campaign? You’ve had an inside view as an advocate – what sticks out for you? KL: What stands out for me as the greatest strength of the Jumbo Wild campaign has been our grassroots people power. That people power took the form of folks from many political stripes joining together and persistently, consistently, refusing to succumb to any vision that didn’t preserve the Central Purcells as a wilderness place. That people power manifested in more ways than we can count and it seemed everyone took a small piece of the responsibility for keeping Jumbo Wild.